Folding is a process in which long chain protein molecules reconfigure themselves into shapes in order to carry out specific functions. Prions are specific disease-causing forms of proteins and are responsible for disorders such as Mad Cow disease and Creutzfeldt-Jakob disease, the human form of Mad Cow disease. 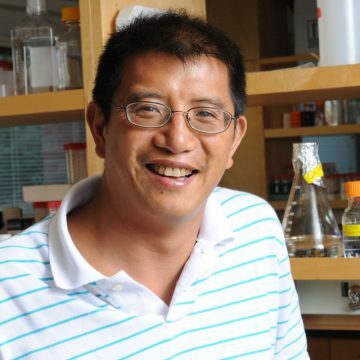 Supattapone and his group are working toward determining the atomic structure of infectious prions to understand how they function at the molecular level. “This award directly reflects the talent and dedication of the wonderful young scientists in our lab, as well as the supportive environment for basic research within the department of biochemistry here at Dartmouth,” Supattapone says. Other Dartmouth faculty being recognized by the AAAS include, Nathaniel Dominy, a professor of anthropology and biological sciences; Eugene Santos Jr., a professor of engineering at Thayer School of Engineering; and Ross Virginia, the Myers Family Professor of Environmental Science. The honorees will be presented with an official certificate and a gold and blue (representing science and engineering, respectively) rosette pin on Saturday, Feb. 18, during the 2017 AAAS annual meeting in Boston. Read the original story at Dartmouth News.